The Thermalution® Deep Diver 70m Undersuit is the world’s only first and only battery heated wetsuit product for scuba divers. Tested to depths up to 250ft, the 70M Thermalution is the perfect tool to fight against the dreaded thermocline. Powered by two 7.4 volt Lithium Polymer batteries and worn under your current scuba wetsuit, Thermalution® turns your existing wetsuit into a heated wetsuit! As water enters the wetsuit on a dive, it circulates throughout your wetsuit and over the Thermalution. This results in an increased water temperature in your wetsuit, keeping your core body temperature warmer, longer. Nearly identical to the core 15m model, the only difference lies in the temperature control unit, which is designed to withhold water pressures of up to 250ft below the surface! Thermalution can be taken with divers on the longest and deepest of dives, helping to warm you when your body alone cannot produce enough heat to keep you warm throughout the dive. With three levels of adjustable heat, your Thermalution heated wetsuit can be adjusted with the push of a button, giving you the warmth you need when you dive deep with the ability to turn off quickly for that warmer safety stop. 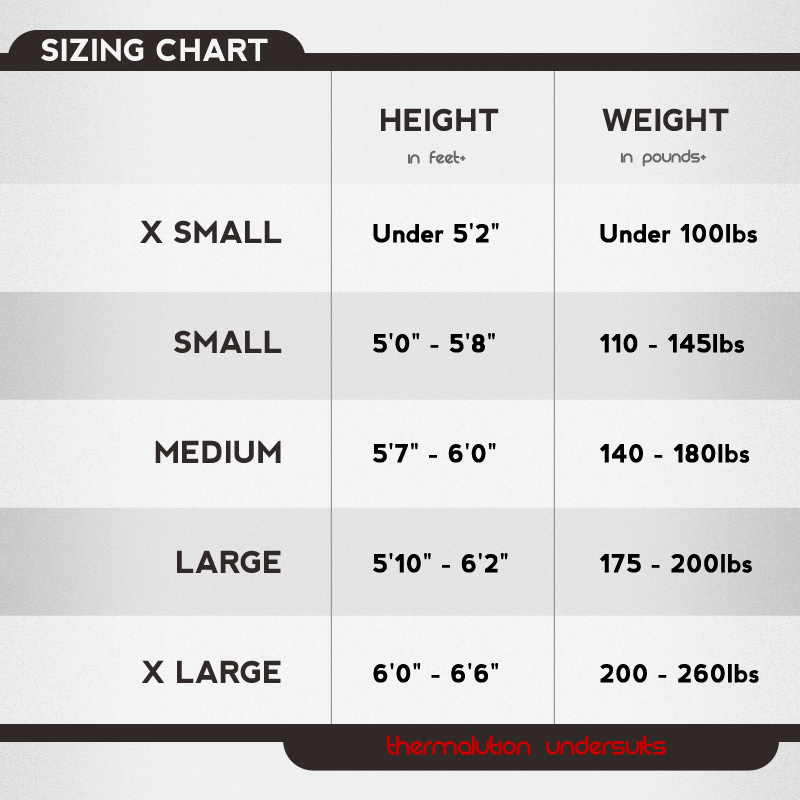 Similar to any base layer clothing (like Under Armor®) Thermalution Undersuits can be worn beneath any wetsuit, dry suit, or jacket. It’s most effective to wear directly on your skin. 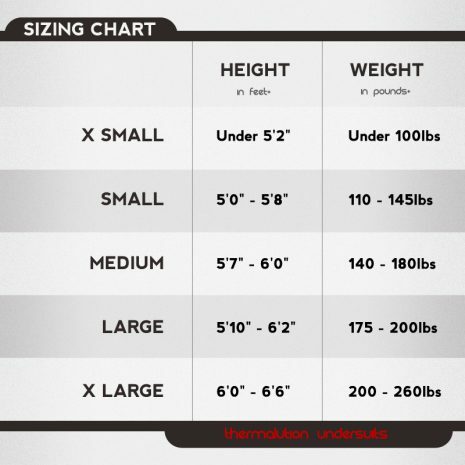 Thermal protection of a wetsuit is limited to insulate your body and minimize heat loss. The thicker the neoprene, the warmer you’ll feel, but you may get extremely exhausted by putting a thick wetsuit on. With our Thermalution® Power Heated Undersuit, you can say good-bye to a thick wetsuit and enjoy a fun cold water sport with a thinner wetsuit, because Thermlation generates heat instead of only been able to reduce heat loss. 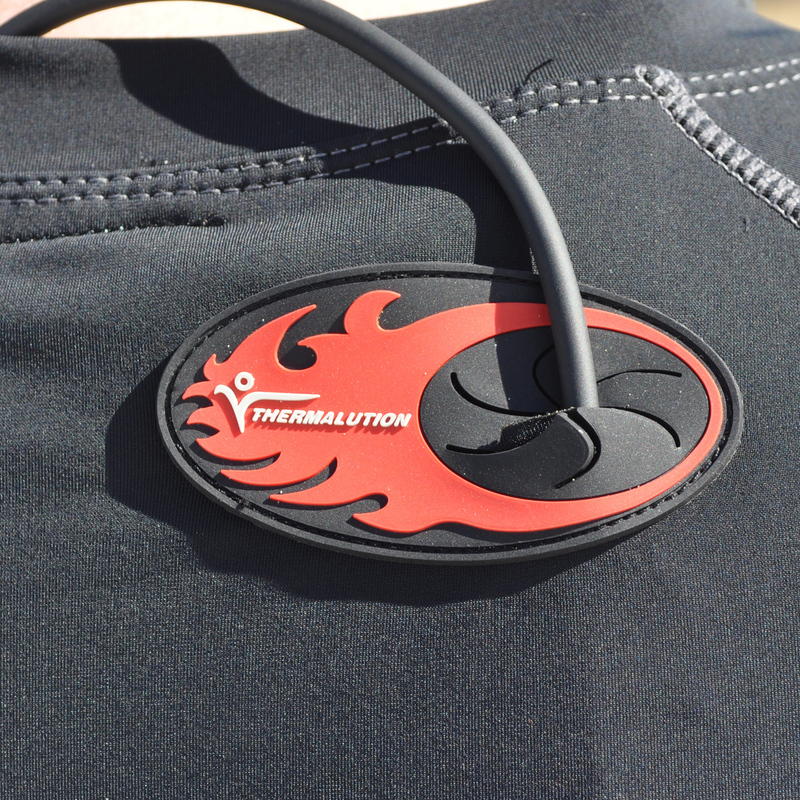 By wearing Thermalution® Power Heated Undersuit beneath your wetsuit it distributes the heat through whole body by the water underneath your wetsuit. 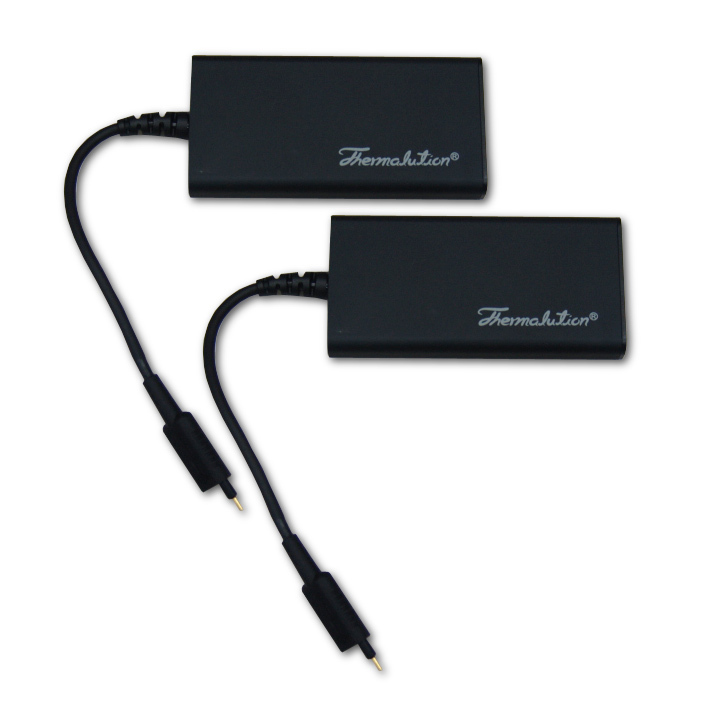 Thermalution Heated Undersuits use two 7.4 volt Lithium Polymer batteries. Battery Size: 4x2x0.5 Inches. These are the same type of batteries found in your mobile phone or mp3 player. There is no danger of radiation, electric shock or explosion from these batteries. Batteries are compact and lightweight and are positioned outside of the undersuit at the sides of the chest, under the arms. It offers maximum freedom of movement and it’s easy to change batteries. The Thermalution is easy to use, heated fast and provided enough heat when I did a night dive. I live in a tropical country and the water temperature this time is around 24C. This is a amazing product! Wore this under my 7mm wet suit in Guadalupe island diving with the Great White Sharks. Cold water! Was able to stay down longer and get great photos of the experience. I am usually shivering underwater after 45 minutes....but, not in this shirt! Would recommend to all. Charges easily and lasts a long time. I bought this to wear under my drysuit while diving in the winter in the Pacific Northwest. It is great! It has nearly doubled the length of my dives. Previously I could go about 30 minutes before I was so cold that that was all I was thinking about. I just spent a week in North Vancouver Island and all my dives were 50+ minutes. I always kept it on low. I can't imagine turning it up higher if you are wearing it under a drysuit. I had to wear 2 shirts under it as well. When I went with only one shirt, my back got burned.....literally. The battery life was okay on low, but if we were out on the boat for back to back dives, the shirt would usually die sometime during the second dive. So I am buying a second set of batteries for back up. My wife is always cold, and she's been using this shirt since 2012. For her, it makes the difference between diving and not. We were on a liveaboard where the crew poured warm water into wetsuits at the end of a night dive. She was the only one who didn't ooh and aah; she said it was what the heated shirt does all dive. After her shirt stopped working on our last trip, she contacted Matt, who offered to repair her broken shirt, sell her a new one with no batteries, or even sell her a used demo shirt. She went for both the repair and the demo shirt, so that she's never without the shirt again--and can loan out the spare to skeptics. The great customer service is almost as good as being warm throughout a dive. My heated vest is great when it works. The last two times it worked great. I find the batteries do not hold the charge for as long as advertised. I have the setting on low. The last time, there was a flashing red light. Nowhere on the web site or in the materials I have tells me what this means. More FAQ's or tech support should be available. The idea is awesome, however there need to be some upgrades and tweaks. Does everything as advertised. Test it for power duration and at Low Heat, the batteries lasted 2 hours and 23 minutes. I have only used it twice, but it has functioned perfectly. I bought this recently and used it for the first time on a dive trip to Galapagos two weeks ago. I have to say I wasn’t impressed. I was wearing it under a 5mm wetsuit and while it provided some warmth it in no way provided me the kind of relief from the cold I expected. It was a small localized heat, even on high. For the price I expected a lot more. I’m unsure what to do with it now as it’s hardly worth the weight in baggage for the warmth it supplied. Another diver expressed the same feelings when diving wet. He however had the wireless one and could use it under a drysuit where he said it was considerably more effective. I used the wet suit for 12 days of diving in the Maldives and it worked great. Really kept my core warm the whole time. However, the thread on both the battery pockets has broken. Not likely to last through another dive trip without repair. I showed it to a tailor and was told the product was made with the wrong stitch for the type of fabric and pockets need to be re-sewn with a stretch stitch to prevent future tearing. For a product this expensive the quality is unacceptable. Just used the heated shirt for the first time in a cenote dive in Mexico. I am alway the one who comes up cold and blue. This time I was warm and smiling while the others were shivering to get warm. The shirt will certainly allow me to do dives I could would not consider before. Before my trip I had some questions and customer support was prompt and thorough. Great product. I bought this just before a trip to Turks and Caicos, I did 5 dives per day and never got even a slight chill, never used anything but low heat setting. Good product. Works great. Battery life could be longer. 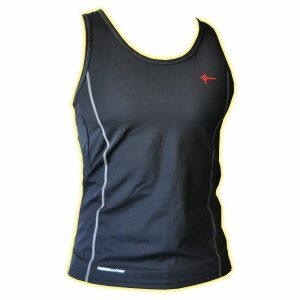 Keeps out the chill and allows for a longer more comfortable dive. Used by my 11 years old daughter in Monterey with a 7mm wetsuit. She operate it with no problem but we need to rent one size bigger wet suit to allow room for the batteries. The switch could pickup sand. Expensive but cheaper than dry suit. With the great customer service I was able to receive a fast size exchange and use the heated vest last week on a week long dive trip to a lake in our state (Idaho). I was under the impression my 7mm Pinnacle would work well but it must not have had a tight enough neck seal and too much water ran in for the vest to work. I went back to my 7mm hooded shorty under my Pinnacle and that worked quite well. Water temps were 68-72 and when I needed the extra warmth it worked well. I used the heated shirt on low except for putting it up to medium for a short time on a little deeper dive. I am looking forward to the cooler water temps to give it more of a trial. I dive about 100 dives a year in 35-80 ranges so it will be fun to work with it with different exposure configurations. It does take forever to dry even overnight I was not able to get it dry during the whole week. I had seen someone wearing this shirt on a liveaboard and thought it seemed excessive. The following liveaboard we were on there was a couple who had them. The woman let me try hers and I was immediately sold. I agree with the other reviewer that the battery life is about 2 hours on low or medium and they take awhile to charge. I'm ordering a second set of batteries so I'm ready for our next liveaboard! Just spent the day at a quarry where the water temps was 42F. Had it not been for my Thermalution, I couldn't have lasted the day in a 7 mm wetsuit...my legs and arms got chilled but my core was nice and toasty...used the same batteries all day. Before this shirt, a hooded vest beneath my 4mm full suit was the only way to stay warm... I'm one of those people that get cold in 70 degree water. I now will often go hoodless... with the two together I am toasty at 60 degrees. My girlfriend loves her so much that she wont even kitesurf without hers. We purchased 2...one L for me and an XS for the misses. We were doing 60 minute dives in the Philippines. The batteries lasted about 100-120 minutes on Low to Medium. By the end of the 2nd dives the batteries/heat was fading or spent. But this made a significant impact on our comfort for the 3rd and 4th dives of the day. While the batteries weren't recharged for those 3rd/4th dives, our core temp wasn't chilled from the earlier dives, so we had a much more enjoyable dives later in the day. We have been diving NE waters all winter. Average temps 31-36deg. I wanted to try something that would give me an edge for at least an hour. The vest met that demand. I wish at the low temp the batteries last longer because by the time you suit up, shore entry, return and begin to let your hands warm up to help getting your gear off the warmth is only residual. My feeling is great product but battery life too short. ...The suits are amazing, but what will make this a company to stand the test of time (besides the product), is their customer service. Ben and Mike, thank you. There was no issue returning the suit for another size. Extremely pleasant to deal with. I now suggest heatedwetsuits.com to all my diver friends. From Orlando, keep up the great work!! The batteries, although advertised for about 2 hours, just aren't long enough if you go to anything but low and turn it off after about 15 minutes until you get cold again. REALLY need 2 sets for folks who dive hour long dives and at least 2 in a day. My Compact Dive Series heated shirt is the best dive gear purchase I've made in years. I'm a dive shop owner and instructor in Hawaii and dive daily (with many dives lasting over 70 minutes) so I get cold pretty easily. I love this shirt so much that I bought one for ever member of our crew so that we could all enjoy being warm all winter long. Come on winter...bring it on. We're ready for you now! I wish they made these years ago, but I am happy someone finally came up with such a wonderful innovation. The charge lasted through two dives and I was amazingly comfortable. The warmed water in the wetsuit can be sloshed around during the dive to other parts of your body, so even though it heats at the back, it works everywhere. I need an extra set of batteries so that I can just switch them out during intervals. The only improvement I would make is a way to secure the batteries in the pockets better. They fall out when you take the vest off over your head and the cords kind of get tangled up. I am such a happy customer I need to buy an extra set of batteries so when I go out on the boats I can switch a set of fresh batteries during my surface interval. Also, I would like to mention that delivery for my order was perfect, it was shipped right as promised and received by the third day. All was communicated promptly, excellent communication! Thank you for selling such a good product. I loved the heated wetsuit. I passed it around to other women in my dive group who chill easily and they also thought it was a fantastic addition to the arsenal of dive gear. After the first dive day I was hooked. I've been diving for about 12 years and always get cold, even in 80-degree water wearing a 3mm wetsuit. I don't like wearing a 5mm wetsuit in tropical locations because of the bulk and the extra weight needed. The Thermalution Compact Dive Series (70M) is a great solution to my problem. I had many questions before purchasing, which Matt at HeatedWetsuits.com answered quickly and thoroughly. I tried the shirt as soon as it arrived and everything worked perfectly. Can't wait to dive with it! This is such a great product. It works just as promised. On a recent trip to the Galapagos the water temperature ranged from 80 degress to 54 degrees - sometimes in the same dive. 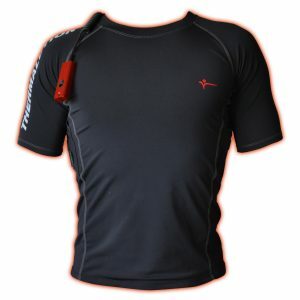 The lightness of the Thermalution shirt let me wear it on all dives and have heat available if the temperature dropped. 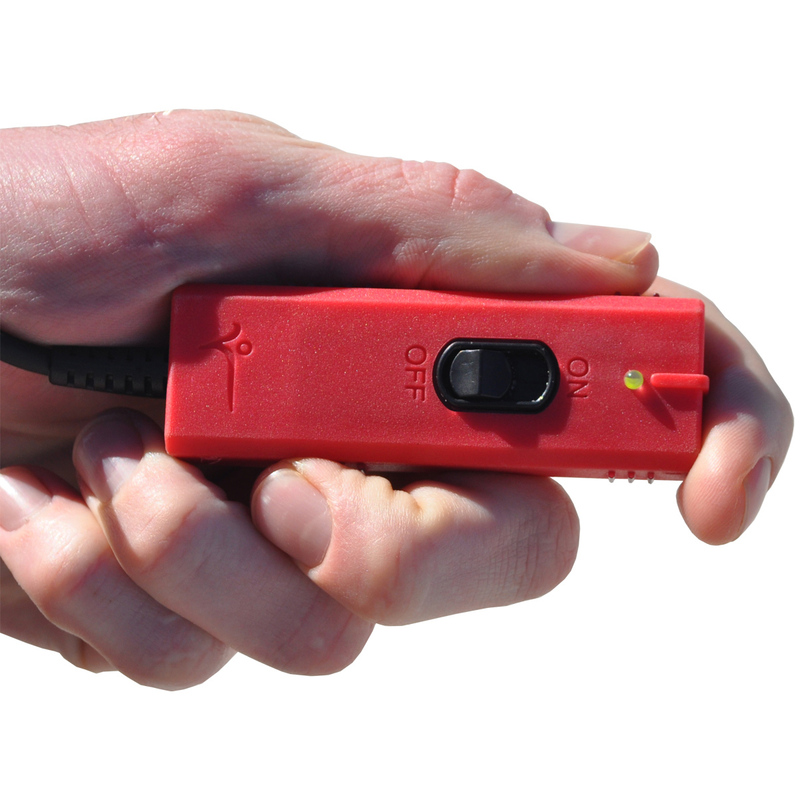 I have recommended it to numerous people, and I know several divers on our boat will be getting some soon. Just like it promised, this vest keeps you warm under you wet suit. No need to get more mil in wet suit or more weights. 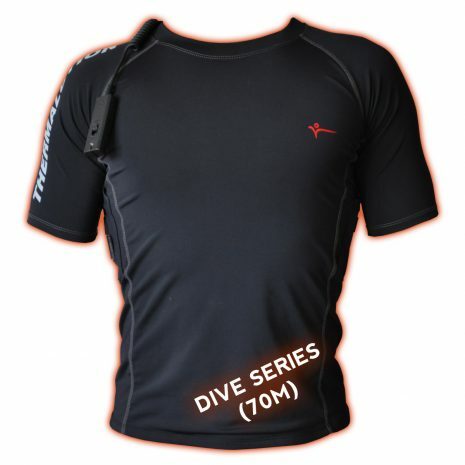 Matt at heatedwetsuits.com has been everything Scuter said in his review "Cold dive more fun when you're warmer!" from 3rd Aug 2012. Thank you Matt! My wife has tried core warmers, Lavacore, thicker wetsuits, and numerous hoods and beanies, all in various combinations, and she swears none of it keeps her comfortable without the Thermalution shirt. Just recently I had to buy her extra batteries because she did not want to turn her Thermalution off during chilly surface intervals. Stealing my batteries was not an option: I've got the older model with 3-prong battery connections instead of the newer 2-prong. Personal opinion: I think the sleeveless is a better choice for a week of diving (sniff, phew). I know Matt would sell more shirts if he could get the price down, but I'm glad I could afford the shirts I have. Used a Thermalution t-shirt last weekend in northern Ohio. I kept the heat setting at low for most of my dives. Worked very well. It was also nice to have on after exiting the water soaking wet into a cold wind. I plan on purchasing another one. Nice product. Used the Thermalution for a week of diving in Monterey , CA. The water temp ranged from 51 to 47 degrees and I stayed comfortable on each dive, each dive lasting about 60 minutes. I was able to keep up with my buddies wearing drysuits. Position of battery packs were great, did not feel them and they did not interfere with my wetsuit or BC. Just attached control switch to my BC with velcro, very easy to reach and control temp, even with 5 mil gloves on. Great product. I just bought the 70M heated undersuit and used it to dive Lake Tahoe. Water temps were from 59-64 degrees. I can compare the temps to a dive a few months ago in Catalina where water temps were 58-63. The Thermalution shirt really helped to keep me warmer in Tahoe than I was in Catalina. I wasn't toasty snuggly warm in my tight fitting 7mil wetsuit, but I was much much warmer than I was in Catalina and that makes it worth it. I could tell that with the heated undershirt, that I wasn't cold like I would have been and it made a cold dive more fun because I wasn't shivering! I wonder if my wetsuit wasn't quite as form fitting as it is, it would have warmed more water within the suit? I think it's a good purchase. Slightly pricey, but way cheaper than a drysuit and that's really the only other option for warmth. Having dove with and without the heated shirt, I will definitely use it for all my cold water dives. Not having a drysuit, I think this is a great option to help with the cold. I also have to mention that Matt from heatedwetsuits.com has one of the best customer service attitudes that I've come across. He was extremely helpful, nice, and communicative in a very timely manner, even on vacation. I had ordered a medium shirt, found it was too small and he sent me back a large immediately before even receiving the medium that I sent back. His attitude and customer service goes a LONG way in my book. Kudo's to Matt and the heated undersuit. I purchased this item with a fair amount of skeptisim. I wasnt sure that it would be worth the cash.. was I wrong.. my most recent dive was in Lake 16, martin MI. This lake is always cold.. got down to 70ft, 44 degrees Farnheight... and if it wasnt for my hands.. I wouldnt have even noticed the water..wearing a 7mm wetsuit.. if they found a way to intergrate the heat to gloves and boots.. I would be in heaven.. 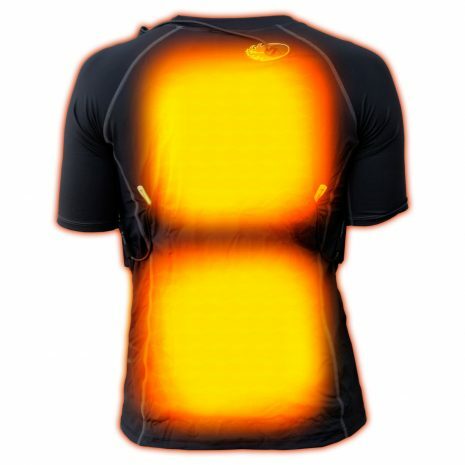 The weight of the shirt with batteries when wet, and the low cut of the shirt are the only 2 items that keep it from a 5 star rating.. The thermalution product is fantastic. The back panel is where the Far Infrared wires are located. I was pleasantly surprised to find that "just heating my back" would keep me warm even tho I was wearing just a 3mm farmer john suit and my legs were covered with just 2 thin pair of Neosport leggings. I was in a pool with temp in mid 60s for 25 minutes doing leg and arm excercises. My legs felt "cold" in the water but when I got out of the pool and into change room I was not cold. Just needed a bathrobe to stay warm and get to my apartment in a hi-rise condo. The unit generates so much heat that I used the medium heat level most of the time. I'm 78 years old. Thanks for carrying this product. There is nothing else like it on the market. I have been using the Deep Water Thermalution throughout our short diving season here in the Chicagoland area and absolutely love it. I normally start to get cold when the water drops below 70 degrees, even with a 7mm wetsuit, hood, and gloves. With the Thermalution, I have been very comfortable down to 57 degrees (with 7mm, hood, & gloves). Its pricey, but well worth it in my opinion. I can't imagine diving without it in cold water ever again!